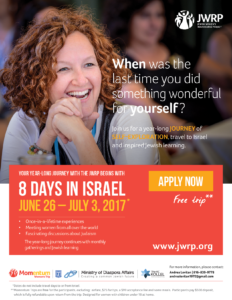 Apply for this amazing, women’s learning and travel experience. The trip is fully subsidized by JWRP and the KC Kollel. I am interested in this trip. I have never been to Israel, and have always wanted to go. Both my parents (of blessed memory) were survivors of the Holocaust, and had visited three times. Please contact me. I know other women who have gone, and spoke very highly of this experience.